Outside of providing fans with a quick thrill, another good aspect of submission victories during UFC events is that it allows the Gracies to dissect the tap so us non-professionals can understand exactly what went down. Although Varner appeared to be winning much of their standup war, the former WEC lightweight champ broke his right hand during the 2ndRound and was forced to change up his game plan and take the scrap to the canvas. Unfortunately for Varner, he entered into J-Lau’s world and found himself wrapped between Lauzon’s legs. Moments later, Varner was forced to cry uncle. 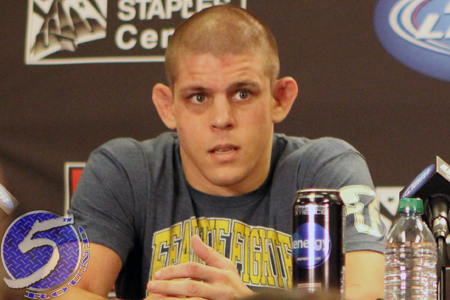 Lauzon pocketed $50,000 for ‘Submission of the Night’ honors. He and Varner also took home the ‘Fight of the Night’ bonus.